Onyx was our very first addition to the family. We got her at 10 weeks old and from the moment she came into our lives we learned of a new happiness and love that we never knew before. 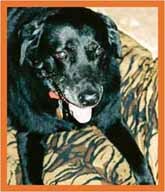 Onyx loved to play, run, and give plenty of love but even though she was a Labrador, the water was no place for her. When we went swimming in the pool, she would run around the pool and hit the ball back to us in the water with her nose. She made everyone laugh. Onyx was happy just being with us and in exchange gave lots of licks, warmth and unconditional love. She was always considerate and extremely smart. When Mark had knee surgery she knew enough, without us telling her, to sleep on the side of the bed away from his knee. Onyx was always a constant friend who you knew would always be waiting for you and loving you, no matter what you looked like or how you felt. She was content lying next to us, sleeping on the bed with us, working out with us and just being wherever we were. Words cannot describe the loss and void we still feel to this day, when we lost our baby Onyx at the age of thirteen. She is in our hearts forever and through this foundation she will live on "FOREVER"